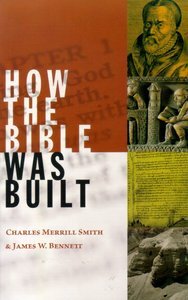 "How the Bible Was Built" is a concise, readable introduction to how the Bible became the Bible. - Publisher The Bible continues to be the world's runaway best-seller. But very few people could say just how its seemingly disparate jumble of writings stories, letters, poems, collections of laws, religious visions got there. Filling this knowledge gap, How the Bible Was Built clearly tells the story of how the Bible came to be.Penned by Charles Merrill Smith in response to his teenage granddaughter's questions, the manuscript was discovered after Smith's death and has been reworked by his friend James Bennett for a wider audience. Free of theological or sectarian slant, this little volume provides a concise, factual overview of the Bible's construction throughout history, outlining how its various books were written and collected and later canonized and translated.Written in an easy conversational style and enhanced by two helpful appendixes (of biblical terms and dates), How the Bible Was Built will give a more informed understanding of the Bible to people of virtually any reading level and any religious persuasion. About "How the Bible Was Built"
The Bible continues to be the world's runaway best-seller. But very few people could say just how its seemingly disparate jumble of writings stories, letters, poems, collections of laws, religious visions got there. Filling this knowledge gap, How the Bible Was Built clearly tells the story of how the Bible came to be.Penned by Charles Merrill Smith in response to his teenage granddaughter's questions, the manuscript was discovered after Smith's death and has been reworked by his friend James Bennett for a wider audience. Free of theological or sectarian slant, this little volume provides a concise, factual overview of the Bible's construction throughout history, outlining how its various books were written and collected and later canonized and translated.Written in an easy conversational style and enhanced by two helpful appendixes (of biblical terms and dates), How the Bible Was Built will give a more informed understanding of the Bible to people of virtually any reading level and any religious persuasion. Charles Merrill Smith (19191985) was a United Methodist minister and the well-known author of such books as How to Become a Bishop without Being Religious, When the Saints Go Marching Out, and the Reverend Randollph mystery series. James Bennett is the illustrator of the New York Times bestselling Halloween by Jerry Seinfeld. A Hamilton King Award-winning artist from the Society of illustrators, he has also illustrated for many major publications including Time, Sports Illustrated, and Mad.